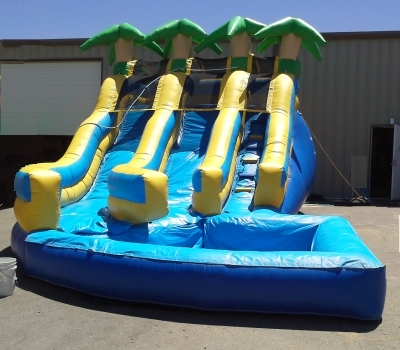 The 14 Foot Dual Lane Curved Water Slide is a front load 14 foot High Water Dual Lane Slide with a pool at the bottom. This thrilling waterslide will take you away to a tropical oasis paradise. You must have access to water so delivering it to the parks is not possible. Please measure the area to make sure it will fit in the space required. Order early for the summer! JumpMaxx prides ourselves in providing America with newer, cleaner, high end entertainment with inflatables like the 14 Foot Dual Lane Curved Water Slide and many others.